Since the legalization of Cannabis in Canada rules and rights in the workplace have changed. Old policies on illicit substances often no longer apply, creating new risks and situations that previously did not exist. As an employer, you have the right to have a safe and effective workplace. This right must now co-exist with your employees’ rights to legally consume cannabis and be accommodated for its use related to medical conditions. What is the right balance? What needs to be updated or changed in your substance use policies? How do you create cannabis safety programs and policies that are effective? Our online course is user friendly, self-paced and mobile friendly. It is clear and easy to understand and remember. Learners must first complete the Employee Cannabis in the Workplace online training, a prerequisite to taking this course. 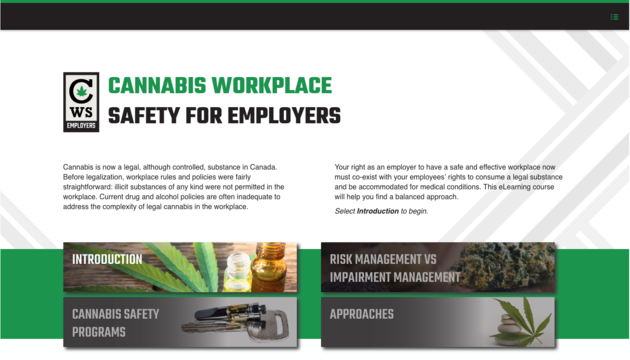 Understand the most effective choice as an employer in a scenario about employees’ use of cannabis.